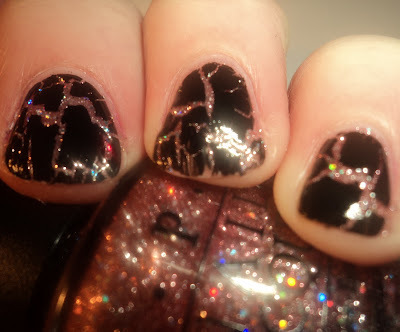 Almost a month after I brought you my first post on OPI's new crackle topcoat, Black Shatter, I'm finally able to review the complete Katy Perry collection. FYI, as each polish has 2 looks, one without the Black Shatter and one with it, I've put the "without" picture above my description and the "with" picture below it. 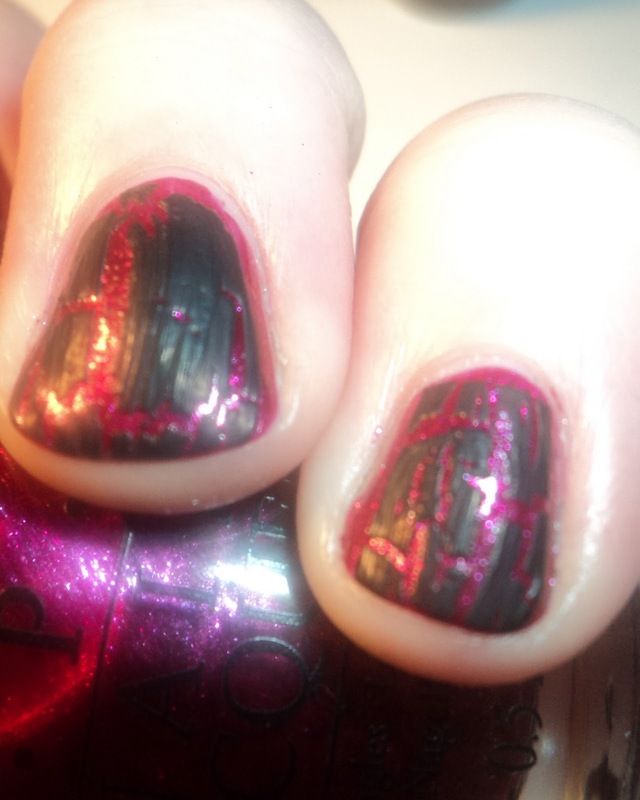 Also, all pictures of Black Shatter, save for The One that Got Away + Black Shatter have a top coat of Seche Vite. Last Friday Night - Blue, green, and holo glitter in a watery, pale blue, clear base. This glitter is very pretty, but unlike Teenage Dream, I wasn't a fan of it alone. 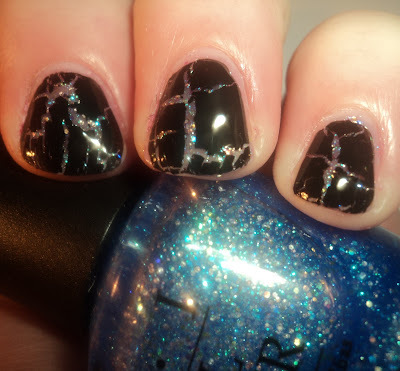 It would look great as a layering polish or under Black Shatter (below). It seemed rather washed out by its lonesome, though. 2 coats. Not Like the Movies - Grey/pink/green/purple/kitchen sink multichrome frost with microglitter shimmer. This color is amazing. Normally, grey-based duo/multichromes don't really do much for me. They have a tendency to give me corpse hands. Plus, while I love them in the bottle, they kind of disappoint on the nail (I fully realize this is not a normal sentiment) In fact, I blog-sold Lippmann Wicked Game for that exact reason. Yet, Not Like the Movies was a total win. The best thing about it is the twinkle of the microglitter. Unlike other frost + glitter combos (i.e. Color Club Ms. Hautie and, to a lesser extent, Barielle Jess' Champagne Toast), the glitter doesn't get lost in this one. It's as beautiful in the bottle as it is on the nail. 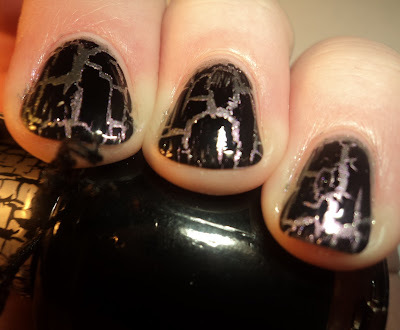 I also happens to look fantastic with Black Shatter (below). The only downside to this polish is the thinness of the formula. It takes 4 coats to reach total opacity. Pic is 4 coats. Teenage Dream - Pale pink and holo glitter in a slightly-pink tinted clear base. This is a total princess polish. Seriously. It was like a cupcake exploded on my nails. And I mean that in a good way. 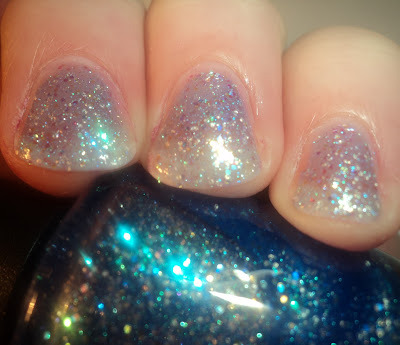 :) The holo glitter in this look like little disco balls. There is something both edgy and yet very ethereal about this polish. Of the 2 glitters, this is my favorite. I love the juxtoposition between the princessness of Teenage Dream and the badass look of Black Shatter (below). 2 coats. The One that Got Away - Bright magenta-red foily metallic. Like OMB! 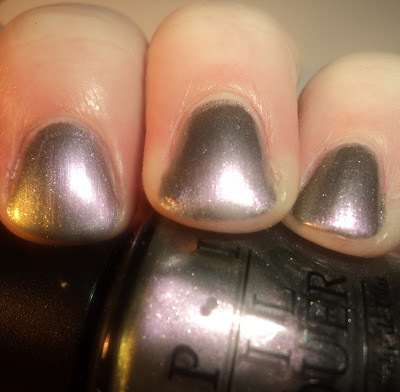 from the Justin Beiber collection, this one really reminded me of the 6 metallics from OPI's Holiday 2010 Burlesque collection. The only difference being that The One that Got Away has microglitter hidden in the shimmer. Also, if you look at this in the bottle you see a faint golden shift. Sadly, this does not translate to the nail. But, it's a gorgeous color, nonetheless. Like all the polishes from the Katy Perry collection, it is a bit thin, but nothing unworkable. 3 coats. I apologize for the craptastic picture of The One that Got Away with Black Shatter. I messed up my middle finger (word to the wise, 2 coats of Black Shatter = Bad). Plus, I forgot to add the topcoat (but atleast you can see what it looks like matte). I think this is my least favorite with the Black Shatter topper, but it's still a nice contrast. All in all, I think this is a nice collaboration with Katy Perry. It seems very reflective of her personal style... girly with an edge. I didn't like the thinness of all the colors. I mean, it was doable, it's just I'm a 2-coat-girl, and each of these were 3+. Again, not a problem... just not my preference. My favorites were Teenage Dream (big surprise) and Not Like the Movies, but they are all pretty colors. OPI Katy Perry collection is out now. It has become a bit scarce at e-tailers, though I've heard it's now at Ulta. Also, I did see it on Amazon. As far as I know, no word yet on if it will be restocked or if shipments are one and done. Nice! I love the Teenage dream with crackle!! Do you have China Glaze Frostbite?? Friday night looks SO PRETTY on it! If you have frost bite, you should try it! I just got this collection and I now have teenage dream on my toes! i am in lover! cupcake indeed lol! I would have never imagined getting the cracking polishes but on top of the glitter it looks pretty cool.